For years I have noticed different colored spools of yarn at my parent’s house. As I grew up my Mom knitted or worked on needle point in her spare time. 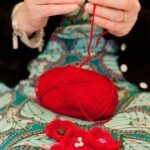 As I have viewed those spools and a half-finished, red sweater tucked in a basket next to the television, I have thought it would be really nice to make use of those spools or maybe finish the sweater for Mom, but I don’t act on it. She has said she will get to it eventually, and maybe at some point knit a throw. It is all hers to finish and I have no right to take that from her. Plus at three different points in my life Mom has patiently worked with me while I tried to knit, but we came to see this was not going to succeed. In August of 2013, Mom suddenly became seriously ill when her immune system attacked her body. As she was hospitalized for a time, I had to step up and run the family’s Internet retail business, and try to fill her “big shoes.” I type “big shoes” figuratively because my Mom has small feet, shopping in the kid’s section to buy size 4 ½ or 5 size shoes. Over the course of many months I have continued to be the main person working with the employees while Mom heals. She is way ahead of the norm when compared to others who have battled the same illness. I have heard it from her doctors, nurses, friends and family who are all amazed at how well she is healing. Yet despite this great thing, I have also become increasingly aware that Mom is having senior moments. She is forgetting things and it takes her longer to remember what that something was. She is 68 years old. I know for all of us at some point as we age it is inevitable that we may experience memory issues. Yet when I look at her, her appearance is ten or so years younger rather than a woman who is nearing seventy. However, I have also noticed her hands shake, and she is starting to get a slight curve to her shoulders and upper back. It has become clearer to me that I had rose colored glasses on that kept Mom suspended in middle age. In seeing her, I am also compelled to think that I don’t want this to sneak up on me when I am her age. I’ve read newspapers, on-line articles or watched news programs that talk about how to keep learning and challenge your brain as you get older. I listen and file this information away for the future. Well on Thursday, May 29th, I decided to act on one of these suggestions: to learn a craft. I was in Michael’s craft store to pick up some jump rings for work, and I decided to take a look at the yarn section. I chose crocheting and found a book suggesting a website to go to as well. I picked out yarn and a hooked needle. I then went to the register and bought it all. Yes, I know I am thirty three years younger than my Mom, and there really is no reason for me to act this way. I assume my memory will be just fine for thirty plus years to come. Yet I felt the need to pick up a craft like Mom used to do. Perhaps I want to keep alive a memory of Mom doing a craft even if it is me actually doing it instead. Sure I couldn’t pick up knitting and needle point isn’t for me, but I think crocheting looks promising. Thursday night I spent part of the evening learning to do a slip knot, learning how to hold the hooked needle, and trying for most of the time to master single crochet stitching. I read the book and went on-line to see the associated videos. By 10pm I felt that for a beginner I had sufficiently learned all three. I also gave double crochet stitching a try, but I think I need much more work on that. I’d like to carry on my new craft for years to come and be able to make things for myself, my niece, and maybe even Mom too. I am now six days into learning to crochet. I visited our local yarn store Saturday afternoon and got some more help. I also found out there will be a class for beginners later this summer that I will attend. So, while I wait for the class I will continue to practice and learn what I can on my own. 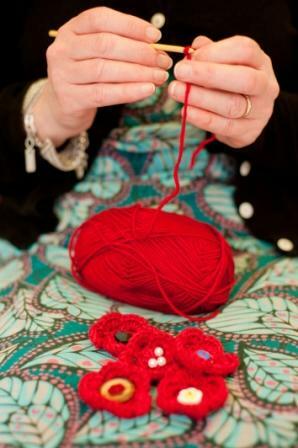 I am excited because I really think I have it in me to crochet….for a lot of reasons.